Not every mama has the option to work from home after she brings that bundle of joy into the world. This truth makes feeding baby challenging for those of us who are pumping and working. The question then becomes, “what am I supposed to do and how do I do it”? Before you go crazy, make sure you know your legal rights on pumping at work and what is supposed to be offered by law to you. Once you are no longer cross-eyed from the legal jargon, you can now focus on the How- To of building your stash. A freezer stash can be really helpful when you’re preparing to go back to work and dealing with that anxiety of how do I feed my child!? 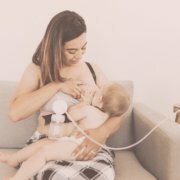 Many nursing moms pump while they’re at work and then have the baby’s caregiver feed the milk they pumped the following day. However, for the first day back at work, you’ll need to have some milk stored up ahead of time for your baby. Here are some ways on how to get started. What’s the best way to start building up a freezer stash? When you’re nursing, it can be hard to know when you should pump for your freezer stash, because you still want to have enough milk in your breasts to feed your baby at his next feeding. Your best bet is to start pumping within 30 minutes after your baby finishes nursing, giving you enough time to get your baby down for a nap or situated with tummy time, but also plenty of time before baby’s next nursing session to give your breasts time to fill up again. When you sit down to pump, you’ll want to pump for about 10-15 minutes on each side. A double electric pump like the Spectra S1 or S2 will be most efficient. How do I store the milk when I’m done pumping? The best way to store breast milk in the freezer is in a breast milk storage bag. When you’re done pumping, use your breast shield as a funnel – put it in the breast milk bag and pour the milk from the bottle into the funnel. This will help make sure that you don’t spill any precious milk when you transfer it. Label the milk with the date, and if you’re going to be bringing frozen milk to a daycare setting, make sure to put your baby’s name on the breast milk bag. To freeze the milk, lay it flat in the freezer; this way, the frozen milk takes up less room and you can stack the breast milk bags easily. How long can you store breast milk in the freezer? This depends on the type of freezer that you have – with most normal freezers (where you’re opening and closing the doors to get ice cream and frozen pizza and other essentials out), breast milk is good for 3-6 months. Deep freezers (which are opened less frequently) will keep breast milk up to a year. A small freezer inside a mini fridge only keeps breast milk for two weeks. If you have a large stash of frozen milk, it’s a good idea to rotate it (using the oldest milk first) so you don’t waste any. What do I do with frozen milk when I’m ready to use it? If you or a caregiver is thawing milk to use immediately, remember that warm water is always best. You can put the bag of frozen milk in a bowl of warm water, which will thaw and heat it at the same time. Be careful not to burn yourself when you reach in to get the milk. (I’ve done this a few times.) Keep in mind that hot water can kill the live cells, so warm water is best and not above 37 degrees C or 98.6 F.
If you’re preparing bottles to be given to your baby the next day, you can thaw the milk in the refrigerator or by putting it in a bowl of cold water. (The cold water will be faster.) Once it’s defrosted, you can put it in bottles and store overnight in the fridge. Thawed milk should be used within 24 hours. Remember mamas, don’t expect to pump A LOT at once; approx. 2oz combined sides is “normal output”.